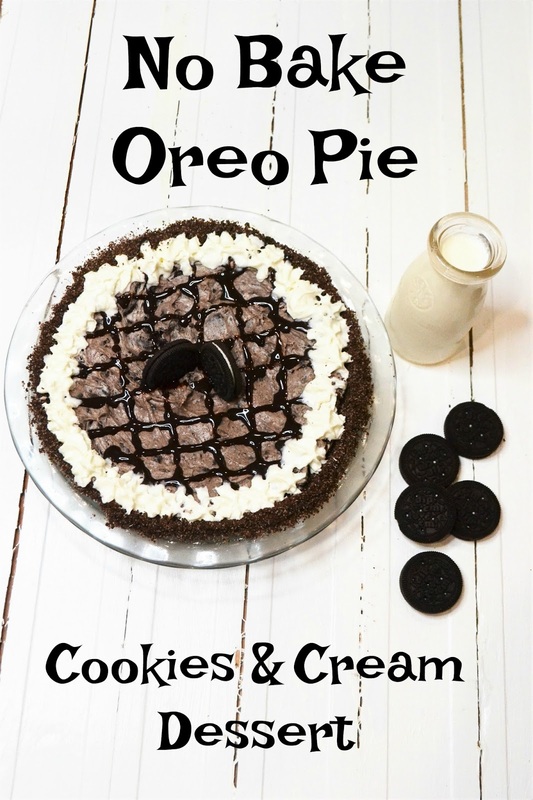 No Bake Oreo Pie is not only a crowd pleaser, it's quick to make! You can throw this dessert together in minutes! And best of all? This is not your typical "pudding" pie! June is Dairy Month, and all week long I've been joining an amazing group of bloggers to celebrate! I hope you've seen all the great recipes this week featuring recipes using dairy products! I had to end the week with dessert! and this one is a family favorite! you can easily make this to take to barbecue or potluck and your pie plate will come home empty! There isn't many dessert's more loved than the combination of cookies and cream! and this pie is no exception! It takes only a few minutes to mix together with rich creamy ingredients, and is so tasty! The longer it is in the fridge, the more the flavors meld together, all though it's delish fresh made too! Jan's Confession: Now.. if you follow my blog, you know I share real world stories, and experiences here, not just the perfect end photos and stories! I normally make my own crusts, (graham cracker crust master mix) but I was in a rush and tried to use a shortcut with a store bought crust.. BIG MISTAKE.. as always, they are so thin.. when I went to spread the filling (which is rather thick) it broke and slid underneath. So I am showing you my "non perfect" first photo shoot below. which i liked better because I didn't "over mix the batter, and you can see the cream and the cookies better than the photo above, where I made my own crust but I feel I mixed it too much and it's too chocolatey.. (is that ever really a problem?). for the photo shoot.. Oh well.. The Tip Garden kitchen is always an adventure! The store bought will be fine, just spread a bit more gently then I did! Or make your own crust! Let's get some pie on! It's the last day of our #DairyMonth celebration and just look at all these recipes! This is totally a pie that I would make and my family would love! Last week for Father's Day I made 5 pies and the pie my 10 year old niece liked the most and said I should make more often was my ice cream pie... Oreo pie shell, softened ice cream, hot fudge drizzled on top... Easy and quick recipes are sometimes the best and everyone's favorite! Who doesn't love oreo cream cheese pies??!! Oh wow; what's not to love about a no-bake Oreo pie?! This looks delicious. Pinned. I have a son who loves all things Oreo. I know this will be a new favorite. Thanks for sharing at Celebrate365.